The state of the agriculture industry was the focus of a panel discussion at the 45th Missouri Governor’s Conference on Agriculture. Leaders of the major farm organizations in the state gave brief updates at the conference held Dec. 18 to 20 in Osage Beach, Missouri. The panel included Gary Marshall-Missouri Corn Growers Association, Gary Wheeler-Missouri Soybean Association, Mark Russell-Missouri Beef Industry Council, Dave Drennan-Missouri Dairy Association, Greg Yielding-Missouri Rice Council, Blake Hurst-Missouri Farm Bureau and Tom Payne-dean of the College of Agriculture, Food and Natural Resource at the University of Missouri. Marshall said the highlights for corn growers in Missouri were high yields. Missouri recorded the highest corn yields in the history of the state with an average statewide yield over 180 bushels per acre. “We are on our way to a 200 bushel statewide yield in a few years,” Marshall said. Nationally corn growers harvested a record number of bushels as well. The downside of this record harvest is a lower price for corn. On the positive side, China is ready to allow MIR 162 into their country. This will open up a significant market for U.S. corn growers. Wheeler has been CEO of the Missouri Soybean Growers Association since April 2014 and before that was on the Missouri Corn Growers staff for nine years . Since then he has added six new staff members to help serve the $4.6 billion soybean industry in Missouri. 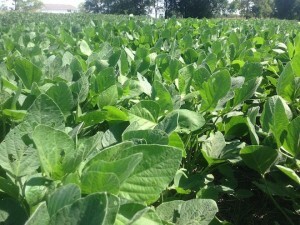 Transportation is one of biggest issues facing Missouri soybean growers. Developing and maintaining the infrastructure along the Mississippi River is critical. Russell said the Missouri beef industry as well as the global beef industry is experiencing unprecedented demand and a unique supply situation. “We are dealing with those issues and trying to supply quality beef not just for consumers in this country but other parts of the world,” Russell said. The export market is very important to the beef industry in this country. Russell said nearly 20 percent of the value of every beef animal finished in the United States is exported. Hurst, with the Missouri Farm Bureau, said the state of the Missouri agriculture is good. Missouri Farm Bureau just celebrated is 100th anniversary at its annual meeting where the membership worked through a full slate of resolutions. Hurst said MFB members would like to tighten rules regarding foreign ownership of land in Missouri—they are concerned about new regulations coming out of Washington, DC, they are concerned about release of producer information and they are concerned about the conditions of roads and bridges across the state. Payne said Mizzou’s College of Agriculture, Food and Natural Resources has close to the highest enrollment it has ever had with 3,700 students enrolled. Payne said 3,200 of those students were undergrads and 500 were graduate students. Enrollment has increased 36 percent in the last six years. “A recent study of undergraduate students show that within six months after they graduate, about 96 percent of them are employed,” Payne said. Drennan said it has been a record year for dairy, but the dairy industry in Missouri is still facing significant challenges. There are 850 Grade A dairy farms in Missouri and Drennan said they need more of them. Over 60 percent of the milk consumed in Missouri is imported from other states. Drennan is optimistic that the Missouri general assembly will pass the Missouri Dairy Revitalization Act, that it will be funded and the governor will sign it in 2015. “That will send a signal that you want to maintain the dairy industry in this state,” Drennan said. Yielding said rice is different from the other commodities grown in Missouri because it is directly consumed. It is not sold for feed or for processing. There were nearly 217,000 acres of rice grown in Missouri in 2014. The U.S. as a whole grows 3 million acres of rice with half of that being grown in Arkansas. Yielding was excited about the opportunity for improved trade with Cuba. That country represents a potential 500,000 metric ton market for U.S. rice. Half of the rice grown in the U.S. is exported. None of that production contains genetically modified rice. Yielding said their customers do not want GMO rice. Overall the condition of Missouri agriculture is good with some specfic concerns for each commodity group.